It was hard to listen to this interview, after seeing it, I have to admit, I agree with M. Brown's mother, sounds like this guy wanted to kill someone, he never used his gun before, and that was his chance. The coldness of the interview shows this guy will kill again if he is ever returned to the streets. I don't know who told him, or if it was his own decision to do this interview, but at this point in time, it was a bad idea, and even if he was coached, you have to be heartless to do it at this time and say the things he did. The perception left after you watch this is not, he had no choice, it's, he actually made things worse. Everything he said, the way he said it was just incredible, you listen to this guy and you get a cold wave running through you. He does say he was hit "with a solid punch" on the right side, does that look like a solid hit from a 300pds man? Look at this, see any marks on the left side. His words; "a very powerful punch". When your hit by a "very powerful man with a solid punch", the marks are black and blue and do not disappear overnight. A cross examination would have pointed that out. The other thing that was scary is, at around 2.20 min. of the video above he said, "I wasn't looking at him, expecting another hit, I put up my gun and fired" he make a head movement to the right, not looking where he was shooting. Aren't police officer trained not to fire blindly in the case they might shoot an innocent person, a woman, a child, a passer-by? Are you telling me, your getting shot and you run towards the person shooting you??? 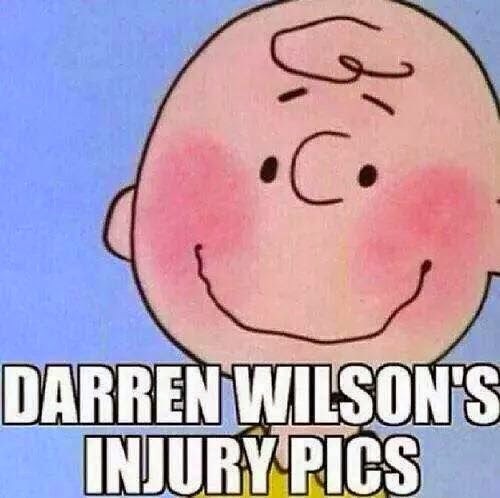 2- The so called injuries to wilson are not direct blows from a 6'4", 300 lbs person, even if he is a 17 year old kid, they are more likely friction burns....(maybe even puberty rosettes, razor burns?)... from brown pulling himself away from wilson during the scuffle, while wilson was trying to hold on or pull him in. ABC News reported that a source said Wilson suffered a "serious facial injury," but these photos certainly seem to refute that characterization. When you see the so called injuries on wilson, the first thing which comes to mind is..."are you serious, they look like rug burns? Not blows from a "very powerful man". And he said, "his conscience is clear, he was doing his job", this guy kills a teenager and his conscience is clear? Killing a human being is just a job to him, that tells you something about what really happened, and who this person is. He should never have been or be a police officer, he doesn't have the character. He admits targeting Browns head, why didn't he target his legs? You can see this is an honest reaction to what just happened. This would had been reason enough to have any of us charged by a grand jury. And shows probable cause to have wilson charged. 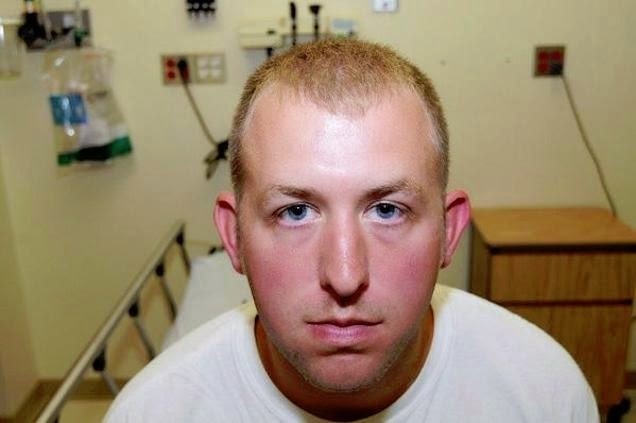 Wilson stopped been a police officer, became a killer, when he shot Brown after his hands went up. The so called marks on wilson does not corroborate this at all. You get hit by someone who is the size and power of such a big man, the marks do not look like rosettes or rug burns. Trust me on this. Here is why; Having been a doorman aka; a bouncer, I saw many fights and the results. Therefore anyone who has been one, knows what I'm talking about and I dare anyone to contradict this. As a doorman, it is not one's job to win a fight, no one wins a fight, a good cooler or bouncer tries to get the problem out the door with little violence as possible. You have to remember at the same time, the person in front of you might want to down a bouncer been inebriated and all, still you have to calm the situation, by talking. Your there to protect people and property. It is not the job of a doorman to prove his power, to chase someone who might have defied you, of even to do it alone, you wait for other bouncers, backup. This defuses the situation. And if it does comes to blows, especially from a big man, I guaranty they do not look like rug burns. That said, (1) when a bouncer has the wrong character and the job goes to his head, eventually something goes wrong, either he or the opponent get hurt badly. I know what a blow from someone who weights almost 300 pds looks like and the marks on wilson do not match his testimony.. So, his claims was dubious at best. That again, was probable cause and should have resulted in him getting charged. The prosecutor should have taken himself out of all this, for personal reason. He did not bring a case to show probable cause to go to trial, but he treated it as a trial without cross examination. That is not a fair process. Wilson's own testimony was not even challenged by a lawyer. So anything he say's would stick with the jurists. This D.A. 's report on the news, did everything to blame Brown, without cross examination? Again not exactly fair. There are many other points to all this but a testimony from the accused that does not fit the actual events, is reason enough to bring him up on charges, and let a court of law decide. None of this was fair, doesn't matter if your white, black, yellow or red, it's about justice and as I said, if it would have been any of us.....it would not have gone the way it did. Fortunately, like what happened in the south in the 60', there is still a chance at justice, bringing wilson on federal charges would be the right thing to do. It would even be better for wilson himself. Wilson should be in jail or on bail at the moment, charged for something, he obviously exaggerated on the stand, and let the courts decide instead of a stacked grand jury. 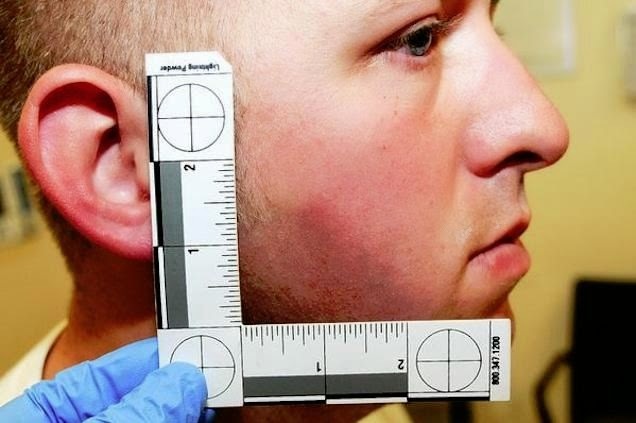 We are not experts, we even might be missing something that would explain all this, but wilson's testimony just does not fit what we can see for ourselves and that is, he used excessive force, he could have gone a different way to diffuse the situation, wait for back-up. (2)When a cop has the wrong character and the job goes to his head, eventually something goes wrong, either he or the opponent get hurt badly. This site does not condemn police officers, we know some who are honest and genuinely want to protect and serve.